“Extremely well written and very frightening”–Barbara Nadel. Life and death played out over 48 hours. A father intent on being with his young son escapes from a secure psychiatric hospital, knowing he has just one chance for the two of them to start a new life together. 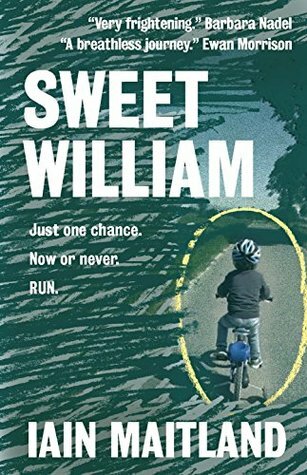 Sweet William is a breathtakingly dark thriller that spans forty-eight hours in the life of a desperate father and a three-year-old child in peril. Brilliant and terrifying, this is a debut novel that will stay with its readers long after they finish turning the pages. I think my heart broke a little more with each chapter that I read about William. William is only 3 years old and already his mummy has been murdered and his daddy is in a secure mental institution. Now William is being cared for by his adoptive parents, his mum’s sister and her husband and he is very excited because they are going to Granny’s and Grandpa’s at Aldeburgh to celebrate Halloween at the Fair. His mummy and daddy sometimes hurt him but at 3 he doesn’t understand that the needles they use on him and not being allowed nice things to eat are because he is a type 1 diabetic. Raymond Orrey is determined to escape and reclaim his son. He knows the family traditions of how they celebrate Halloween, this year he will be making it one that they will never forget. He is one hell of a cunning and crazy guy that has played the system and people who call all the shots until he has been moved into a more lax ‘secure’ unit. One that he is going to escape from. What an edgy and ultimately terrifying read. When I opened this book I moved into the mind of Raymond and boy is this bloke needed locking up. Raymond has one goal to take his son back and make a new life for them and no one will stop him. The story is violent but seen through Raymond’s eyes Iain Maitland pulls off and captures the whole thing through Raymond’s flippant reasoning. It makes petrifying reading. Raymond is so focused that he can only see the end game not what is right under his nose. William I just wanted to pick up and hug. This is innocence at its purest, being in his mind too and hearing his reasoning to the situation he was in and how he felt. A little boy who never lost hope. It all becomes a race against time before more lives are lost and tragedy occurs. This is an edge of your seat, nail-biting read that will haunt you way after you finish reading.